People often ask what is a home inspection. To answer your question a home inspection is a visual non-invasive snapshot of the condition of the home at the time of the inspection. A home inspection should only be performed trained and qualified home inspector. The home inspection should clearly identify potential significant defects that may affect your buying decision. Additionally, the home inspection should identify areas in need of repairs, plus components that are reaching the end of their useful lifespan. The inspection of a typical home usually takes between 2 and 3 hours, depending upon the size and condition of the home. The home inspection can be a useful negotiating tool. The job of the home inspector is to identify the condition of the residence. The role of the Realtor is to assist you with every other aspect of your home purchase. Always look to a professional real estate agent to advise you what you should and should not ask for that was cited in your home inspection. How to find a home inspector? After people understand what a home inspector is looking and they deciede to hire a home inspector, The next question is how to choose a home inspector. Well, we always recommend you only hire a ASHI Certified Home Inspector professional. ASHI Certified Home Inspectors are trained and have experience in evaluating all the component features in a house, and and to draw you a clear and accurate picture of the condition of these components. They also are currently the only home inspectors with third party credentials through the National Commission for Certifying Agencies (NCCA). The home inspector should want you to be present for the home inspection and should make himself available to you after the Inspection, to clarify or answer any questions you may have about the Inspection and Report. An Inspector can be an invaluable resource for you, long after you have moved in. A quality Home Inspection, performed by a professional, is designed to provide you with the information you need to make a more informed decision about your potential purchase. ASHI has the highest educational standards in the home inspection industry. The ASHI Standard of Practice and Code of Ethics have been adopted by states as the standard by which their licenses are based. ASHI is the only home inspector association that is recognized as a certifying body by the National Commission for Certifying Agencies (NCAA). Home inspectors climb onto the roof, poke around the foundation and crawl space if there is one. They crawl into the attic space looking for roof and ceiling structure issues, ventilation issues, water condensation or penetration. The inspector looks at the mechanical, plumbing, and electrical system along with buildings interior components and finishes. Home inspectors also walk around the exterior of the property and look at a long list of this from the grading to the windows/doors and the exterior of the home. Pretty much looking at everything from the roots or foundation up. The inspector may also include general comments about cosmetic issues along with providing recommendations on all issues found and ips on maintaining the home. GROUNDS / SITE – The drainage, downspouts, drain/vents, water stop box/meter, window wells, retaining walls, walks, steps, stoops, driveways, fencing, and landscaping. BUILDING EXTERIOR – The siding type, siding condition, gables, fascias, soffits, entry, bay/bow windows, decorative trim, painted finishes, electrical, water spigots, masonry, and brickwork. EXTERIOR WINDOWS / DOORS – Entry doors (front, side, rear, basement), sliding doors, windows, screens, storm windows, and basement windows. PORCHES / DECKS – Materials, method of construction, rails, trim, structure, steps, and flooring. GENERAL INTERIOR FINISHES – Walls, ceilings, floors, interior stairs, steps, handrails, cabinetry, built-ins, and interior doors. KITCHEN/BATHS/BARS – The Cabinetry, counter tops, sink, faucet, drains, appliances, outlets, switches, lighting, walls, ceilings, ventilation, and bars. GARAGES – Fire walls and ceilings, doors, vehicle doors, and electric door operators. FOUNDATIONS/CRAWL SPACES – Foundation walls, bearing structures, floor structure, sub-floor, basement floors, floor drains, sump pumps, stairs and rails, evidence of moisture, crawl space area, crawl space structure, and crawl space floor/ventilation. 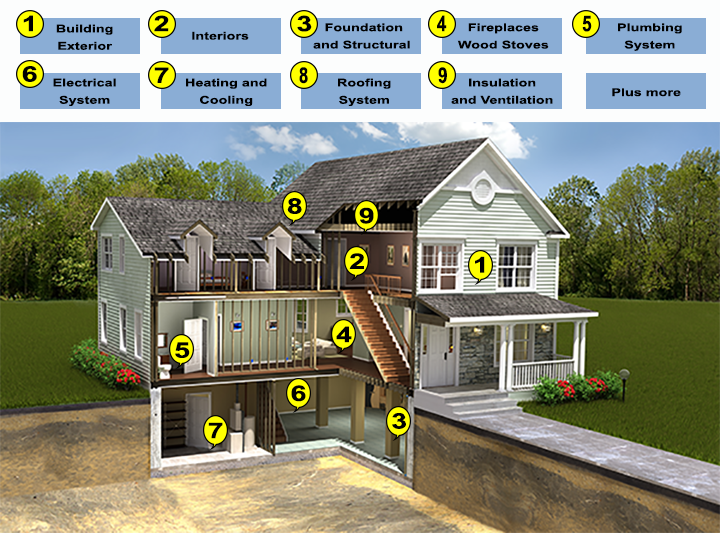 ATTIC – Type of structure, roof/ceiling structure, roof decking, attic insulation, attic ventilation, moisture issues, whole house fans, wall insulation, electrical, HVAC ductwork, and chimney/flue piping. A. inspect structural components including the foundation and framing. 1. the methods used to inspect under-floor crawlspaces and attics. A. provide engineering or architectural services or analysis. B. offer an opinion about the adequacy of structural systems and components. C. enter under-floor crawlspace areas that have less than 24 inches of vertical clearance between components and the ground or that have an access opening smaller than 16 inches by 24 inches. D. traverse attic load-bearing components that are concealed by insulation or by other materials. FIREPLACES/WOOD BURNING STOVES – The construction materials, construction type, flue, damper, and gas logs. 1. fuel-burning fireplaces, stoves, and fireplace inserts. 2. fuel-burning accessories installed in fireplaces. 3. chimneys and vent systems. B. describe systems and components listed in 12.1.A.1 and .2. 1. interiors of vent systems, flues, and chimneys that are not readily accessible. 2. fire screens and doors. 6. combustion air components and to determine their adequacy. 7. heat distribution assists (gravity fed and fan assisted). 8. fuel-burning fireplaces and appliances located outside the inspected structures. C. move fireplace inserts and stoves or firebox contents. PLUMBING SYSTEMS – The water main, main water shut-off, interior visible piping, supply/shut-off valves, water pressure, and drain/waste/vent piping. HOT WATER – Document the manufacturer, age, capacity, power source, burners, controls, valves, TPR valve, overflow, flue, and expansion tank. BATHROOMS – Document/Inspect the type, fixtures, faucets, drains, electrical, floor, walls, tubs, shower, and ventilation. KITCHEN/BARS – The Cabinetry, counter tops, sink, faucet, all drains. All other components are inspected as part of the interior finishes. LAUNDRY FACILITIES – Water supplies, drainage, electrical, dryer facilities, cabinetry, sinks, drains, and faucets. ELECTRICAL SYSTEMS – Service size, service entry cable, panel type, main shut-off, system ground, over current protection, electrical panels, visible circuitry, outlets, switch, lighting, fans, GFCI/AFCI protection, and smoke detectors. 5. interior components of service panels and sub-panels. 7. over current protection devices. 9. ground fault circuit interrupters and arc fault circuit interrupters. 1. amperage rating of the service. 2. location of main disconnect(s) and subpanels. 3. presence or absence of smoke alarms and carbon monoxide alarms. 4. the predominant branch circuit wiring method. 2. or test smoke and carbon monoxide alarms, security systems, and other signaling and warning devices. 4. ancillary wiring systems and components not a part of the primary electrical power distribution system. 5. solar, geothermal, wind, and other renewable energy systems. B. measure amperage, voltage, and impedance. C. determine the age and type of smoke alarms and carbon monoxide alarms. HEATING/COOLING SYSTEMS – Type of systems, fuel source, age, capacity, housing, heat exchanger/elements, compressors, refrigerant lines, blower/motor, flue, fuel lines and valves, distribution ducts/pipes, filters, electrical service, registers/radiators, and more. 4. electric air cleaning and sanitizing devices. 5. heating systems using ground-source, water-source, solar, and renewable energy technologies. 6. heat-recovery and similar whole-house mechanical ventilation systems. ROOFING – The roofing materials, roof style, valleys, gutters, downspouts, flues, vent pipes, skylights, flashing, and chimneys. B. interiors of vent systems, flues, and chimneys that are not readily accessible. INSULATION – Attic, bathroom, kitchen, laundry room, whole house fans. VENTILATION – Wall and attic insulation where visible. Plus additional items depending of the unique caricteristics of the property. Along with storage and out building.